The complete results to include the list of topnotchers or top 10 passers for March 2017 Pharmacist board exam are available on this page as released on Tuesday, March 14, 2017). Rhys Jansen Tiu Pavon from University of Santo Tomas (UST) topped the board with 94.73%. 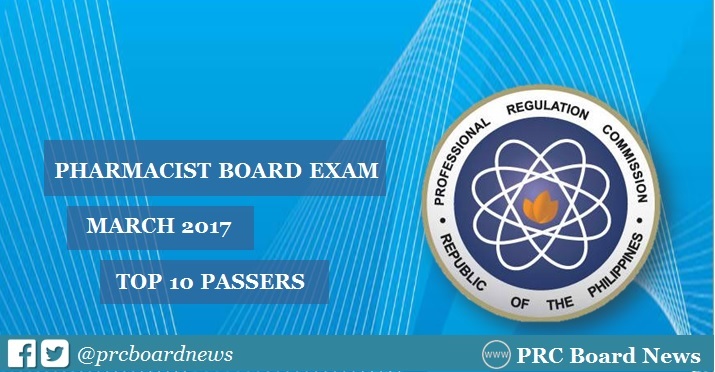 The Professional Regulation Commission (PRC) and the Board of Pharmacy conducted the first Pharmacist board exam on March 9 and 10, 2017 in the cities of Manila, Baguio, Cebu, Davao and Iloilo. In July 2015 exam, a University of Santo Tomas (UST) graduate topped the board with 93.35%. Meanwhile, University of the Philippines (UP)-Manila and University of the Immaculate Coception - Davao City alum got the highest place for January and June 2016, respectively, garnering 92.50% and 92.85%.